Eversince former Davao Mayor now President of the Philippines, Rodrigo Roa Duterte had been very vocal on his stance regarding 'Death Penalty.' Start from his campaign till now that he is sitting, he'd been working on bringing back death penalty here in the Philippines. Now with a vote of 12 aggrees, 6 disaggree and 1 abstain, Justice Committee in the House of Representatives approves death penalty bill. Below is the complete context restoration of the said bill. What do you think on death penalty bill? Please took the comment box below and share your thoughts below. 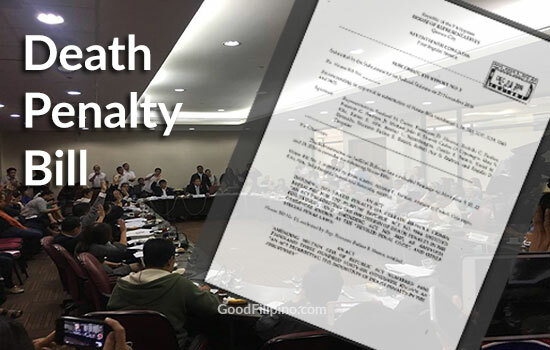 Comments or suggestions about "JUST IN: House Justice Committee approves bill on death penalty" is important to us, you may share it by using the comment box below.